During asymptomatic HSV-2 reactivation, clusters of two to four CD8-positive cytotoxic T cells (green) form around HSV-2-infected keratinocyte cells. These are most likely CD8-alpha-alpha-positive cells given their localization to the dermal-epidermal junction. Arrows in the left panel mark cells that are magnified at the right. 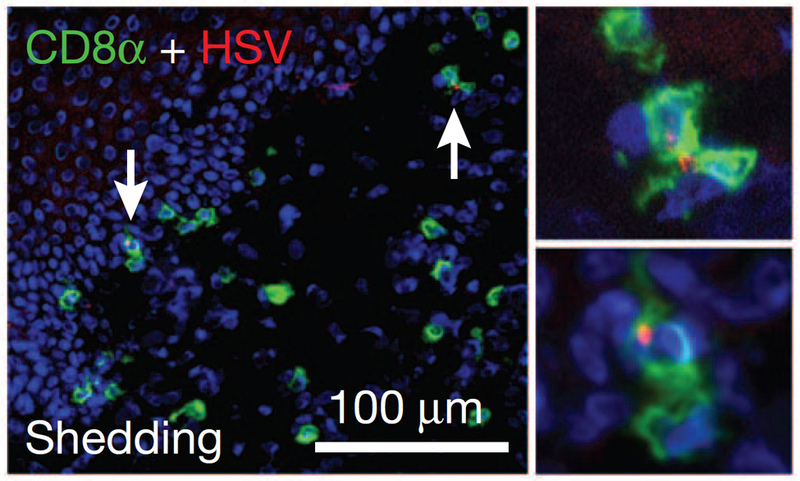 Red staining shows the punctate distribution of HSV-2 antigen in the keratinocytes. Reproduced from Fig. 3b of Zhu et al., 2013 (Nature 497:494-497) with the permission of Macmillan Publishers Ltd. Genital herpes is one of the most common chronic viral infections in the world. Herpes simplex virus 2 (HSV-2) causes the vast majority of cases of this sexually-transmitted disease, whereas HSV-1 is the herpesvirus type typically associated with cold sores in and around the oral mucosa. Once a person is infected with genital herpes, a quiescent source of HSV-2 persists in the cell bodies of the sensory neurons that project from the genital tract to the spinal cord. For the rest of their lives, infected individuals will experience HSV-2 reactivations, in which herpes viruses arise from this dormant neuronal source and infect keratinocytes in the genital tract. These recurrent HSV-2 episodes can involve painful lesions in and around the genital tract, or they can be totally asymptomatic yet still be infectious to others. Herpes has no cure. Since the risk of acquiring human immunodeficiency virus (HIV) increases substantially as a result of HSV-2 infection (Zhu et al., 2009), latent HSV-2 infection is a major public health concern. The duration and severity of HSV-2 episodes can be managed with antiviral medications such as aciclovir or famciclovir (Schiffer et al., 2011). Unfortunately, however, antiviral drugs against HSV-2 do not reduce the risk that individuals with genital herpes will contract HIV. This route to HIV infection and the widespread suffering caused by genital herpes itself are strong motivators for the development of an HSV-2 vaccine, yet important gaps in our understanding of the cellular immune response to HSV-2 have made the road to such a vaccine a difficult one. In a recent paper published in the journal Nature, lead author Dr. Jia Zhu (Research Assistant Professor in the Dept. of Laboratory Medicine, University of Washington; and Affiliate Investigator in the Vaccine and Infectious Disease Division, Fred Hutchinson Cancer Research Center) and colleagues demonstrate that a novel phenotype of skin-resident cytotoxic T cell plays a key role in controlling HSV-2 episodes in infected individuals. This finding potentially paves the way for the eventual development of an HSV-2 vaccine. The study's eleven co-authors from the Fred Hutchinson Cancer Research Center and/or the University of Washington include Dr. Tao Peng of the Corey Lab and Dr. Larry Corey, president and director of the Hutchinson Center. In an earlier study, Zhu et al. (2007) used an immunofluorescent staining approach (involving quantum dot-conjugated peptide-MHC multimers) to investigate the in vivo localization of HSV-2-specific cytotoxic (CD8+) T cells in genital skin biopsies taken during acute, resolving and healed stages of genital herpes reactivation. This work demonstrated that virus-specific CD8+ T cells persist at the portal of neuronal release of HSV-2 (sensory nerve endings in the genital skin) and that these cells dictate the clinical course of genital herpes recurrence. Yet, questions remained about the specific CD8+ T cell phenotype and its function in containing HSV-2 reactivation. The researchers addressed these questions in the most recent paper by collecting individual CD8+ T cells from the tissue biopsies. Dr. Zhu and his colleagues accomplished this using laser capture microdissection, which they followed with transcriptional profiling and T cell receptor genotyping of the precisely 'captured' lymphocytes. Zhu et al. found that a CD8αα+ type of T cell occurs preferentially at the dermal-epidermal junction at the sites of ongoing or past HSV-2 episodes. This cell type selectively persists at such sites for at least eight weeks following clearance of a genital ulcer. Conversely, CD8αβ+ T cells, found in the dermis and near blood vessels, do not selectively persist in the genital skin following lesion healing. As the authors also showed, CD8αα+ T cells lack expression of chemokine receptors underlying the chemotaxis that has been demonstrated in circulating T lymphocytes. This likely explains why these cells persist at the site of an HSV-2 episode. In addition, the CD8αα+ T cells exhibit a strong gene expression signature of antiviral activity against HSV-2, including the expression of perforin, a cytolytic protein that punches holes in the membranes of virus-infected host cells. Virus shedding episodes during which HSV-2 infections are rapidly contained and no visible symptoms appear are associated with a high ratio of tissue-resident CD8+ T cells to virally infected cells (see figure). In contrast, symptomatic episodes resulting in visible lesions are associated with a lower tissue-resident CD8+ T cell to target cell ratio, demonstrating the pivotal role that tissue-resident CD8αα+ T cells play in immune surveillance and containment of genital herpes. The findings of Zhu et al. highlight the importance of tissue-resident immunity in the effective control of viral infections at the body's most important barrier, its outer surface. This work also illustrates a novel type of tissue-resident CD8+ T cells (CD8αα+) that is distinct from these lymphocytes' blood-circulating counterparts (CD8αβ+ T cells). These key advancements in our understanding of the human immune response to HSV-2 suggest that future work toward the development of an HSV-2 vaccine (or immunotherapeutic agent) should attempt to up-regulate the cellular immune response involving skin-resident CD8αα+ T cells. Moreover, according to Dr. Zhu, "it will be very interesting to investigate whether these CD8αα+ T cells also play an important role in other skin and mucosa infections, such as HIV or human papillomavirus." Equally important, the Corey Lab hopes to eventually identify the peptide epitopes recognized by these CD8+ T cells, which underlie disease surveillance at the body's frontline of defense against infections. Zhu J, Peng T, Johnston C, Phasouk K, Kask AS, Klock A, Jin L, Diem K, Koelle DM, Wald A, Robins H, Corey L. 2013. Immune surveillance by CD8αα+ skin-resident T cells in human herpes virus infection. Nature 497:494-97. Also see: Zhu J, Koelle DM, Cao J, Vazquez J, Huang ML, Hladik F, Wald A, Corey L. 2007. Virus-specific CD8+ T cells accumulate near sensory nerve endings in genital skin during subclinical HSV-2 reactivation. J. Exp. Med. 204:595-603. Zhu J, Hladik F, Woodward A, Klock A, Peng T, Johnston C, Remington M, Magaret A, Koelle DM, Wald A, Corey L. 2009. Persistence of HIV-1 receptor-positive cells after HSV-2 reactivation is a potential mechanism for increased HIV-1 acquisition. Nat. Med. 15:886-92. Schiffer JT, Magaret A, Selke S, Corey L, Wald A. 2011. Detailed analysis of mucosal herpes simplex virus-2 replication kinetics with and without antiviral therapy. J. Antimicrob. Chemother. 66:2593-600.